The first ever Lost Bougle was a brutal 4 day stroke Event, which Leroy won with skied drives hitting fairways, followed up by laser irons into the hearts of greens. Just like a laser golf robot – it was incredible. Bas finished 2nd of course, in usual Bas tradition, either winner or runner-up – the man is never out of it. Felix (who was just learning golf!) came in in third position, and Cravo waaaaaay back in last spot suffering golf mental degradation and basically crying like a baby. Memorable Leroy moments aside from the lasers, were from the big bunker on 4 at Barny – where he had a few, then came out backwards and carded an 11 on the hole (gave up 8 shots off the stick to Bas and Cravo, who both birdied! Didn’t matter though – killed it for the rest of the tourney). 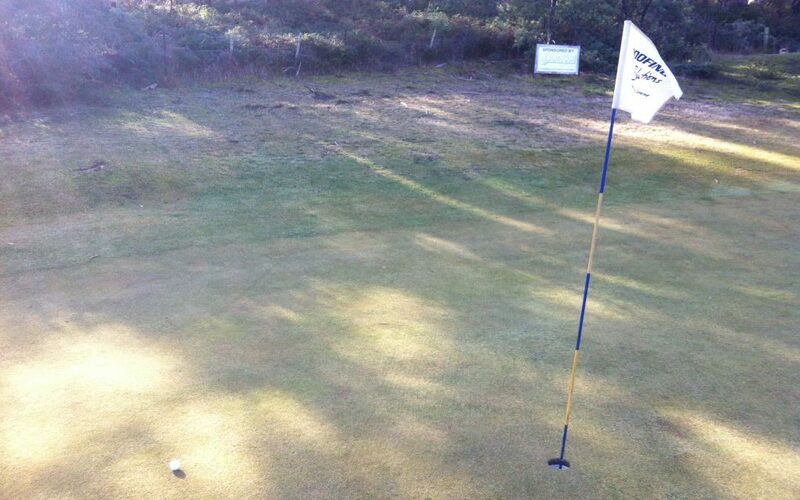 And also hit an awesome shot from a bush on 6, where he played a fine tennis volley and popped it on the green. Should I also mention that Bas may have got us to play off the Black tees one day in a futile effort to claw back some ground on Leroy? Didn’t phase him. Well done Leroy – first ever Lost Bougle Champ!! Leroy – showing the famous Badger sunburn that he is renowned for. The man simply refuses to wear sunscreen. Summary: Day one brought strong winds and testing conditions. Lwah had the form leading in to the Tourney, and he started on fire with two pars in the opening three holes at Barny, until disaster struck on the 4th. He went in the big bunker and had about 5 tries getting out, carding an 11 and totally losing his cool. Basil and Leigh birdied it so he gave away 8 shots right there. But after that Lwah quickly found an unshakable calm and focus to work his way back into it. Felix had just started the game of golf and was finding it frustrating at times, and he found the need to modify one or two bunker walls by smashing them with his iron. Lwah won the fairway count, hit pure laser-like irons into the greens, hit a great volley out of a bush on the 6th at Barny and proceeded to evil giggle his way to handicap the next three days – proving just too good for Basil. The mental degradation of struggling with his game through 4 rounds of golf at 2 unforgiving courses had Leigh crying like a baby by the end. At least he did ok at Carcassonne. Best shot trophy went to Basil for two impeccable 5 woods onto the 5th Green at Lost. Take your pick of either. Pure. Posted on August 10, 2016 May 8, 2017 by Gentlepersons' World Golf Tour, Tasmania	This entry was posted in golf and tagged barnbougle, golf, lasers, lost farm, majors, tasmania, world tour. Bookmark the permalink.